As the only electronics engineer in my family and circle of friends, it is sometimes not possible to evade an appeal for help. This time the request came from a friendly elderly lady in a retirement home. In her room the light switch by the door and the pull cord above the bed operate the light fitting on the ceiling in the middle of the room. However, she would prefer that her standing lamp was operated by these switches instead, since she does not actually have a light fitting mounted on the ceiling. This standing lamp has an on/off switch in the power cord and is plugged into a power point. However, it stands rather far from the bed so that she always has to find her way in the dark. A wireless operated power point is not really a consideration, because it is just a matter of time before the remote is lost. Or maybe not? 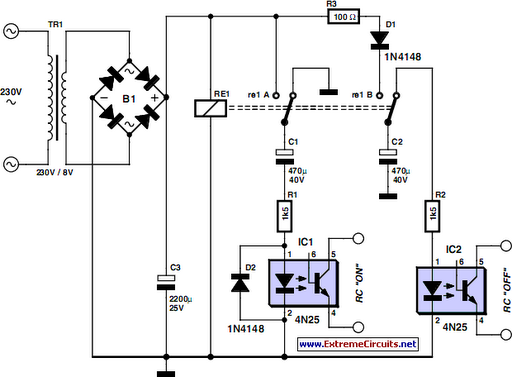 Behold a feasible circuit. Buy a wireless power point and an enclosure that is big enough for the remote control and a small piece of prototyping board. On the proto-typing board build the circuit according to the accompanying schematic and (carefully) open the remote control and solder wires to the push buttons for ‘on’ and ‘off’. Measure if these are polarised and if that is the case connect them to the 4N25 opto-couplers as shown in the schematic, where pin 5 has a higher voltage than pin 4.The operation is as follows. The lady operates the pull cord or light switch to turn the light on. This causes the mains voltage to be applied to the transformer. The relay is activated which charges C1. While C1 charges, a small current flows through optocoupler 1. The result is that the ‘on’ button on the remote control is pressed. The remote control switches the corresponding power point on and to which the standing lamp is connected. The standing lamp will therefore now turn on. Capacitor C2 is charged at the same time. If the lady pulls the cord again, or if she operates the switch near the door, the relay will de-energize and C2 discharges across optocoupler #2. This operates the ‘off’ contact of the remote control and the light goes out. The remote control continuous to operate from its normal battery and the white enclosure is attached to the ceiling in place of the light fitting. Diode D1 ensures that C1 is discharged when the relay de-energises. D2 ensures that C2 cannot discharge across the relay, but only across optocoupler 2.